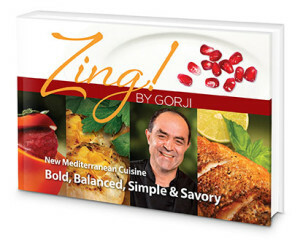 Chef Gorji, author of Zing! will demonstrate recipes from his Cookbook at the Dallas Convention Center Sunday followed by book signing. Dallas’ Chef Gorji, owner and chef of Canary By Gorji Restaurant, Gorji Gourmet Foods® and author of Zing! By Gorji cookbook will join national and local chefs on the Taste of Travel stage at the Dallas Travel Show Sunday October 26, 2014. He will be preparing his Mediterranean Ragout and Shrimp, recipes from his debut cookbook Zing! By Gorji—New Mediterranean Cuisine: Bold, Balanced, Simple and Savory. Before and after his demonstration, he will be available to discuss and sign books next to the stage in the booth of Cuisine Noir Magazine #932, the exclusive media sponsor of the Taste of Travel stage. The 5th Annual Dallas Travel & Adventure Show is where travel lovers come for travel inspiration, expert information and fun, cultural interaction. It’s where you’ll discover thousands of authentic travel experiences and speak directly to the travel experts who can get you there, give you the inside scoop, and save you money on exclusive travel deals along with exhibits, seminars and culinary demonstrations. At the Taste of Travel Stage you can discover the unique cultural flavors of local, regional, and worldwide cuisine. Dallas Travel & Adventure Show is proud to partner with the North Texas Food Bank, where they want attendees to Travel Globally & Feed Locally. By entering promotional code FEED at travelshows.com when buying tickets you will provide three meals to NTFB, where $1 equals three meals for our DFW community. No Replies to "Dallas Travel Show Cooking Demo & Cookbook Signing"